In March, the Milwaukee Police and Fire Departments will complete in two hockey games to raise money for charities. In March, the Milwaukee Police and Fire Departments will compete in two hockey games to raise money for charities. 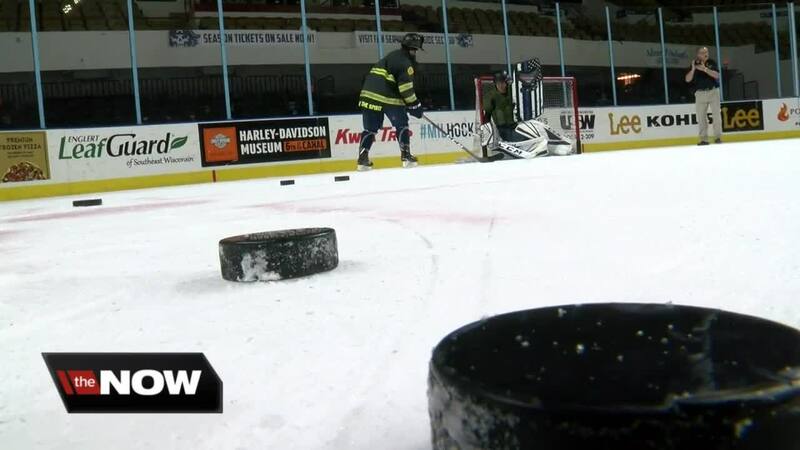 A spirited photo shoot to promote the games pit a Milwaukee Admirals hockey player in firefighter gear against another Admirals player in police gear. "It's heavy. My neck's getting a workout right now," said Admirals right wing Zach Magwood. The game is called the Battle of the Badges. "I can't give away any of their secrets," said firefighter Joe Flick, "but I can tell you they've been hyping themselves up for this game. It's a big deal for them." "No, there's no secrets," contended police officer Craig Nawotka. "You just go out, you practice hard, you play hard." The game raises money for charities like Ignite the Spirit Milwaukee, Burn Camp, and Cops for Kids. Admirals players couldn't be more proud to promote the cause. "The police and fire departments play such a great role in every community and just to be able to help them out a little bit is a huge honor," said Tom McCollum, Admirals goaltender. The Battle of the Badges is March 16th. For more information click here.